Water Quality in Singapore: E-version of my book "Your first guide to water quality monitoring in Singapore" is out! E-version of my book "Your first guide to water quality monitoring in Singapore" is out! In case some of you are not aware, you can download a free (yes, free!) 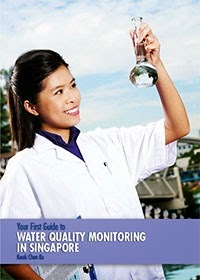 e-version of my book "Your first guide to water quality monitoring in Singapore" at PUB's website. Due to new security requirements for government websites by IDA, the above link to PUB no longer works and I have no idea whether it will be reinstated in the future. If you would like to have an electronic copy, please join my mailing list here. Once your subscription has been confirmed, you will be offered the option to download a copy. The most critical water quality parameters to monitor. How to design a robust water quality monitoring programme for a chosen water body. Common problems encountered and how to avoid them.